The power of social media is real, people. Former WEC and UFC lightweight champion Anthony ‘Showtime’ Pettis has fought as low as 145-pounds in his career. Although it was a brief stint, Pettis did make the cut… At least for one fight. However, since returning to 155-pounds at lightweight and going 2-2 since doing so, Pettis would recently reveal some interest in moving up to welterweight where he wanted to face two-time title challenger, Stephen ‘Wonderboy’ Thompson. After seeing the callout, Thompson wouldn’t back down as he voiced his openness to the idea. ESPN’s Ariel Helwani has now confirmed that the bout between the two is close to finalization for the March 23 fight night on ESPN+. It does not have a location set yet but is believed to be taking place in Nashville, Tennesse. 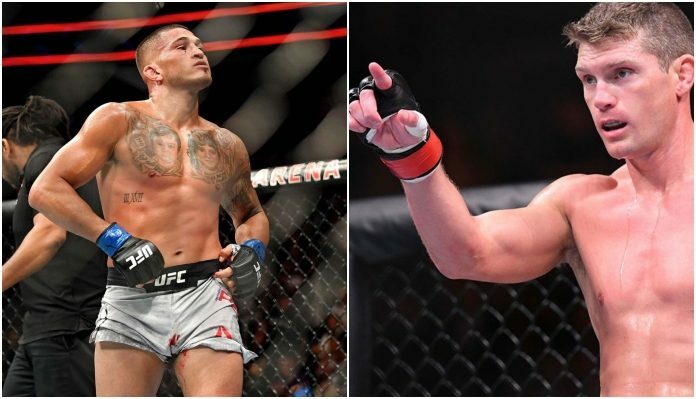 “Stephen Thompson vs. Anthony Pettis at 170 pounds is verbally agreed to for the March 23 fight night event, which is expected to be in Nashville. Fight isn’t signed just yet but expected to be finalized shortly. Story coming to ESPN in a bit.” Helwani tweeted. The man known as Showtime fought as recently as UFC 229 in October 2018 when he took on Tony Ferguson. In a fight of the night effort, Pettis would, unfortunately, suffer defeat between the second and third round as he broke his hand. For Wonderboy, on the other hand, his last fight came in May 2018 when he suffered a close decision loss to Darren Till who was unbeaten at the time. Thus making Thompson 1-2-1 in his last four outings. Thompson’s last win actually came over another former lightweight in Jorge Masvidal. Will he be able to make it another over Pettis?